Shawn Cullinane was recently awarded the Distinguished Service Award by the New York State Association of City and Village Clerks (NYSACVC) for his many years of providing legal counsel and advice to the association. 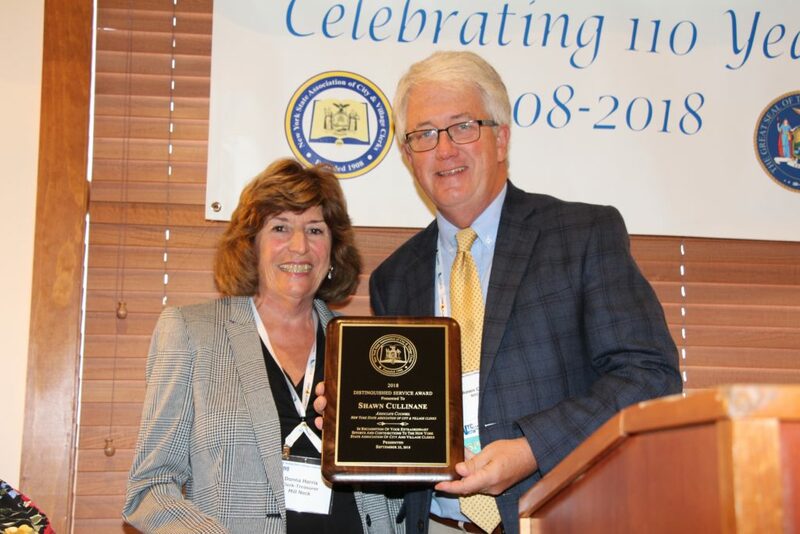 The Distinguished Service Award is presented annually at the NYSACVC Annual Meeting held during the NYCOM Fall Training School, of which NYCLASS is a sponsor. Shawn was selected for this award not only for his unique and special contributions as an advisor to NYSACVC but for his continued support and assistance to promote the goals of the association. “His experience, knowledge, and professionalism exceeds the criteria for the award,” said Donna Harris, Chair of the Awards Committee. Prior to joining NYCLASS as a Regional Director of Marketing in 2017, Shawn spent nearly 30 years as Clerk-Treasurer for the Village of Lindenhurst, New York. It was during that time that he became involved with NYSACVC, rising up the ranks to eventually serve as President from 2000 to 2001. He continued his involvement as Legal Counsel to the State Association for nearly 15 years, even after leaving the Village of Lindenhurst. Congratulations, Shawn, and thanks for your hard work contributing to the ongoing success of the NYCLASS program.